As great as Twitter is, it’s not something you want to mess up. A misplaced tweet here, a rogue hashtag there, and your online reputation is ruined forever. In early 2012, McDonald’s launched a promoted #McDStories campaign meant to drum up positive, hamburger-friendly stories about the awesomeness of the fast-food chain and its suppliers. But even though McDonald’s only used the hashtag twice, it turned nasty within minutes. People pounced on #McDStories, using it as a channel to vent their frustrations on everything from fingernails in McNuggets to animal cruelty. McDonald’s pulled #McDStories within 2 hours, but not before thousands of people had their say. 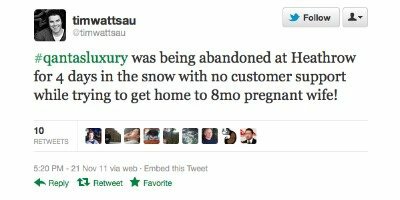 Last year, Qantas invited Twitter users to enter a #QantasLuxury competition, asking them to describe their “dream luxury in-flight experience” for the chance to win a Qantas prize pack. Sounds harmless, but the campaign launched just a day after Qantas and its unions broke off contract negotiations, and just a month after Qantas grounded its entire fleet and left thousands of passengers stranded worldwide. Eighteen hours later, Twitter was still registering 25 tweets per second on this hashtag—almost of them negative. 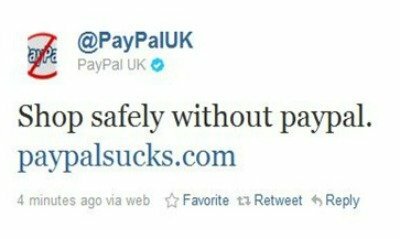 A disgruntled customer took control of PayPal UK’s Twitter account last July and used it to not only complain about the service, but also to direct users to the corporate hate website, paypalsucks.com. He even re-tweeted messages by other users that were either talking about PayPal in a negative light or congratulating the person for hacking the account. PayPal regained control of their account several hours later and deleted all of the tweets. But as you know, you can never really delete tweets. Shortly after Justin Bieber celebrated his 19 millionth follower, some weirdo hacked into his account and began to unfollow and block some of Bieber’s fans. He also posted a message that was removed almost immediately, but the accompanying hashtag was so amusing that it quickly became a trending topic. 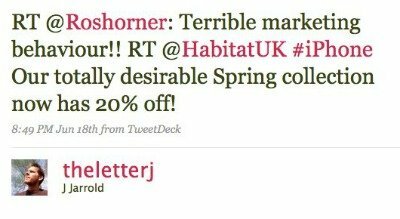 Furniture retailer Habitat blamed an “overenthusiastic intern” for using trending topics to promote their spring sale. 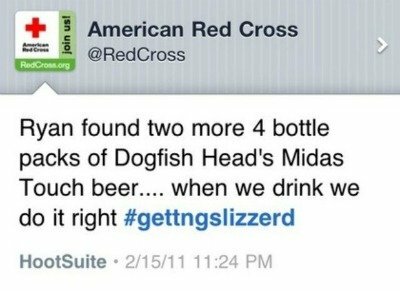 His tweets, which promoted Habitat’s “totally desirable Spring collection,” included tasteless hashtag spam such as #Iran, #Mousavi, #iPhone and #TrueBlood. The intern was fired. 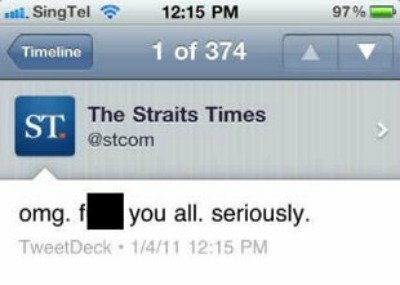 A similar corporate/personal mix-up happened at the Straits Times, when an employee accidentally sent out a vulgar tweet to over a hundred thousand of the newspaper’s followers. A Sony PR rep retweeted a PS3 jailbreak code from an official Sony Twitter account because he thought it was a reference to Battleship. And if that wasn’t bad enough, the whole debacle occurred less than a month after Sony went after the hacker group that jailbroke the PS3 and released the how-to details online. 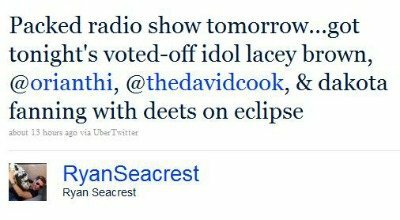 While using his account to promote his morning radio show, Ryan Seacrest announced Lacey Brown’s elimination from American Idol—before the results show aired. Over 3 million followers learned that she had been cut from the Top 12, which is probably why that particular episode had the lowest viewing in American Idol history.